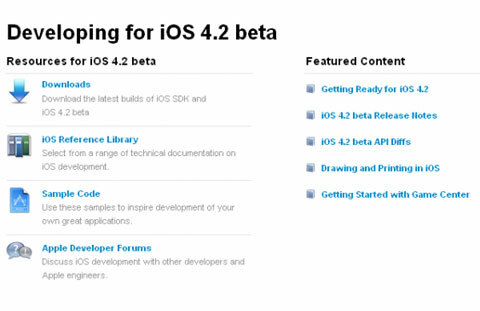 Apple has promised to release iOS 4.2 in November this year and has just made its first beta available to developers. The new version provides builds for the iPad, iPhone 3G, 3GS, 4 and iPod Touch Generations 2/3/4. The biggest new feature of the 4.2 version that’s making news all around the web is wireless printing for the iPad, iPhone and iPod Touch. The feature is called AirPrint and it will allow users to print wirelessly over Wi-Fi, without needing to install drivers or software. The first devices to support AirPrint will be HP’s line of ePrint enabled printers. AirPrint is Apple’s powerful new printing architecture that matches the simplicity of iOS—no set up, no configuration, no printer drivers and no software to download. iPad, iPhone and iPod touch users can simply tap to print their documents or photos wirelessly to an HP ePrint printer or to a printer shared on a Mac or PC. We’re pleased to work with Apple to bring Apple’s AirPrint to our fall line up of ePrint printers in time for the holiday shopping season. Making it easy for our customers to print anytime, anywhere, is a key priority for HP. iPad, iPhone and iPod touch customers are going to love how easy it is to print using our new range of ePrint printers, creating high-quality printed pages in an instant. AirPrint will bring support for a wide range of printers from entry level inkjet printers to office laser printers. Users will be able to print from shared printers through a Mac or a PC. It also supports a bunch of handy functions like page range selection and the option to choose single sided or double sided printing. The Print Centre available on AirPrint will coordinate your print queue so you can keep a track of the printing process from a distance. Compatible printers currently include the HP Photosmart, Officejet, Officejet Pro and LaserJet Pro series ePrint enabled printers. •	Game Centre for iPad. •	AirPlay, which allows you to stream video from an iPad, iPhone and iPod Touch to an Apple TV device with the click of a button. •	Unified Inbox and Threaded Mail for iPad. •	Search within Web pages in Safari. •	30 new international keyboards. •	Option to change fonts in notes.